A contemporary boutique hotel in a low-rise adobe structure the 3 Palms offers a large outdoor pool and spa with a poolside bar, a rooftop sundeck, a 24 hour fitness room, an on-site restaurant (opening June 2007), and a self-service laundry. Business travelers will be pleased with our conference and meeting facilities, business center tools, complementary high-speed Internet access in the lobby and all guest rooms, complementary wireless Internet access throughout the common areas and dry-cleaning and laundry service. El Dorado Park is adjacent to the hotel which is just two miles to the south of Old Town Scottsdale, three miles south of the Fashion Square Mall, and four miles from Arizona State University. Our King Room with Whirlpool offers sophistication with high style. Surrounded by Granite walls, the oversized Kohler jetted tub built for two is strategically located for convenience and comfort. The luxurious, pillow top king bed is enhanced by crisp white 400 count sheets and down comforter. An entertainment center comes complete with a 27 " television, and DVD/CD player. Feel the comforts of home with added amenities such as blow dryer, coffee maker, microwave, refrigerator, safe, iron and ironing board. A granite top desk connects you to complimentary high speed internet along with a cordless phone. Our lavish bathroom, featuring a large walk-in shower is sheathed in black granite, and is accented by the finest terry linens. Our Deluxe Queen Room offers sophistication with a contemporary style. The luxurious, pillow top queen bed is enhanced by 400 count sheets and inviting down comforters. This room features a pull out sofabed. An entertainment center complete with a 27 inch television, and DVD/CD player, add to the comforts of home. While other amenities such as an in room blow dryer, coffee maker, microwave, refrigerator, safe, iron and ironing board, all add convenience. A granite work station, connected to high speed internet and cordless phone is as productive as it is beautiful. Our lavish bathroom is sheathed in black granite, and is accented by the finest linens. 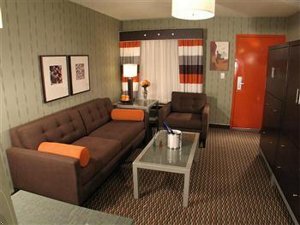 Our Dual Queen Room offers sophistication with high style. The luxurious, pillow top queen beds are enhanced by crisp white 400 count sheets and down comforters. An entertainment center comes complete with a 27 " television, and DVD/CD player. Feel the comforts of home with added amenities such as blow dryer, coffee maker, microwave, refrigerator, safe, iron and ironing board. A granite top desk connects you to complimentary high speed internet along with a cordless phone. Our lavish bathroom, featuring a large walk-in shower is sheathed in black granite, and is accented by the finest terry linens.